Today is the last formal school day of Amber's 7th grade year. We can't say it is officially the last day, because any hours she earns between now and the end of June are tacked onto this school year. But it's our last day of her formal 7th grade lessons! I know it's an old cliche to say how hard it is to believe your kids are getting older, but seriously it's so true. Some days I feel like we *just* started homeschooling not a week or two ago, while in reality it's been three and a half years. I think back to when it seemed we had an eternity to homeschool Amber, even though the original plan was to only go through 8th grade. Now, we are planning the curriculum for that 8th grade year and it feels like in just a few short moments she will be finished with school all together. For this week being our last full time school week, there was a shortage of school work completed. Monday we took as a holiday since it was actually a holiday. Tuesday Amber only finished about a half a day's worth of work because we took my car in for it's regular maintenance and spent the entire morning at the Volvo dealership, then met Fred for lunch on the way home. Pretty much the only school work completed that day was what Amber did at the dealership. 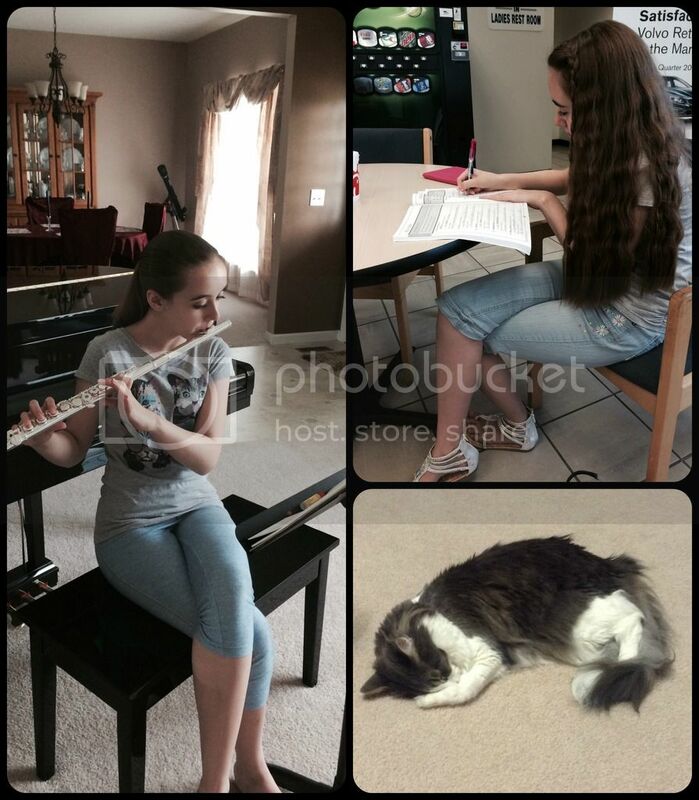 She still manages her flute practices; Working on Greek and Latin vocabulary at the Volvo dealership; Milori being even more adorable than normal. While my car wasn't due yet for it's maintenance for about another 600 miles, I'll be driving more than that in a couple of weeks to take Amber up north. I decided to have the car checked out in advance of the trip. It was a good thing too. One of my tires had picked up a nail and was ever so slowly leaking air. I had my suspicions about that tire; it hadn't been feeling "right" lately and needed a little air last month. Thankfully I didn't find out about that nail in the middle of Iowa. Wednesday, we just totally flaked out on school. I mean Amber didn't even think about starting school until after errands and lunch. She took a quick German test before her flute lesson, then did two of the last few morphemes lessons after flute. That was it for the day and I didn't really care. I had gotten myself gluten-ed at lunch on Tuesday (Red Robin bacon is not gluten free, apparently) and thus felt pretty miserable most of Wednesday. 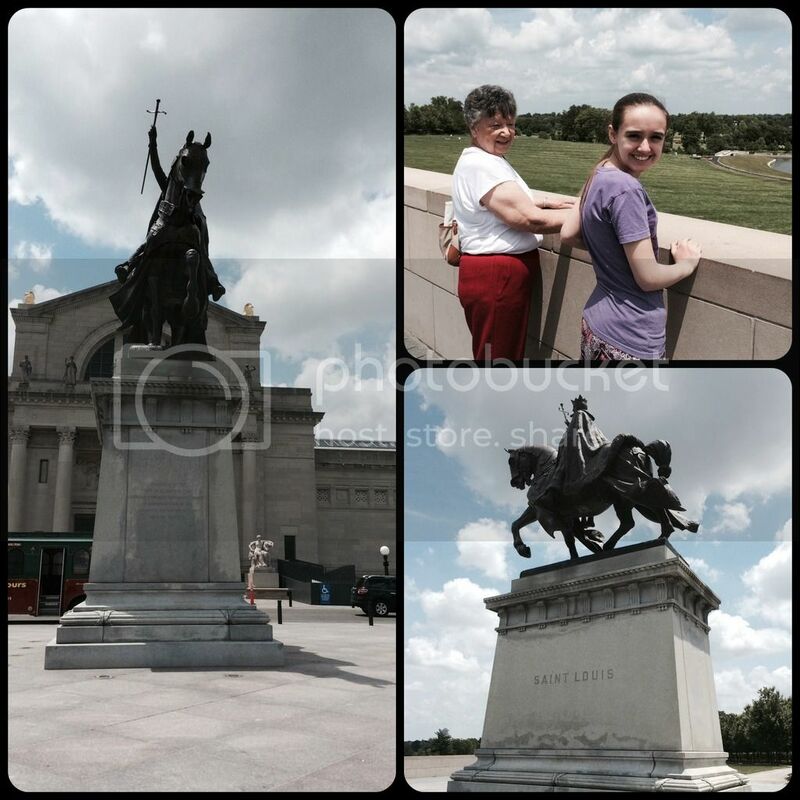 Thursday we took the long awaited trip with my mom to the St. Louis Art Museum. I have always loved to visit the art museum, and they recently completed an addition to the building. After seeing it in person, I'm not sure it was all a positive change. However, they did add a parking garage that keeps the cars cooler and out of the elements, even if it isn't free parking anymore. We did a cursory look in the free parking section, but then went for the garage and it was worth every last penny of the $15.00. In front of the St. Louis Art Museum. The statue of Saint Louis. Plus, Mom and Amber looking out over Art Hill. We had been trying since last September to schedule, and re-schedule the visit to the Art Museum but every time we attempted Amber would have a flare up of her dysautonomia to the point where she wasn't going to be able to walk even from the car to the museum. She still wasn't feeling so spiffy on Thursday either due to the storms all week and now being off all her medication. However, we had a new plan - my mom brought my dad's wheelchair up from the basement for Amber to use. This was the first time she ever used the wheelchair, but she has used the motorized carts at the store. Amber was so afraid people would think she was faking it because she doesn't have a visibly broken limb or other ailment. She forgot that even though my dad was on oxygen it wasn't the primary reason he needed the wheelchair either, yet no one questioned him. In the end, Amber did fine in the wheelchair and even practiced moving herself around without being pushed. 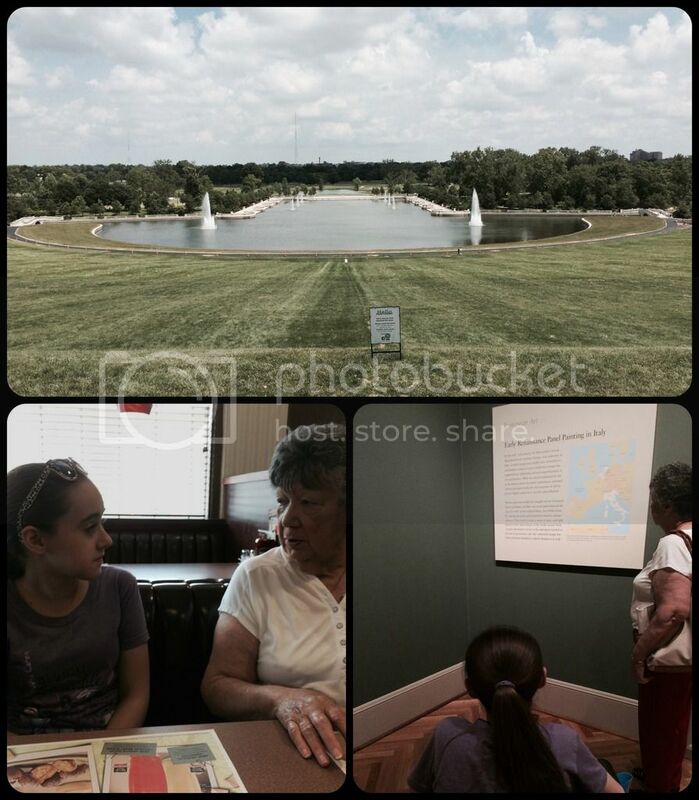 She did get exhausted and her joints did their crazy aching despite riding around the museum and out to see Art Hill across the street. There is so much she wants to do in Forest Park now that she's accepted that a wheelchair might be needed for longer events, at least until we get her leveled out again. Inside the museum we focused mainly on the collection of Renaissance art, since that is what we just finished studying in history. However, I can't go to the art museum without checking on the Impressionists, especially since everything was moved around. St. Louis has 1/3 of Monet's Agapanthus (water lilies) triptych along with several other Monet pieces. Amber was appropriately awed at the actual size of the piece. I was thrilled to see the Degas painting was out again too. It had been put in storage years ago and only the Degas sculpture was out for the public to view. Maybe the addition wasn't such a bad thing since there is more space now for the Degas. Today we are wrapping up whatever lessons we have time or inclination to finish after a fun shopping trip to celebrate the last day of school. All the academic subjects remaining are ongoing topics that will continue over the summer, so there is nothing that needs to be finished immediately. I'm severely lacking in motivation myself and can't really expect more out of Amber. Amber is excited to start her summer reading, meaning there is very little reading assigned and she has all the time she wants to read fantasy books. If you're interested, check out our list of Middle School Fantasy books! I guess we are off to the library today too! Sounds like a pretty good week! I'm glad Amber was able to enjoy the museum despite her initial apprehension to use the wheelchair. I'd hate for her to miss activities like that because she is worried about what people will think. Tell her from me that It's nobody's business and she should continue to enjoy her life. She is a sweetie! A lovely week! I'm planning to take my girls to the Detroit Institute of Art next month, and then hopefully to the museum in Toledo Ohio as well! Sounds like a fun week ... museums are always fun to visit... aside from the educational part of it, it's always fun to see things we normally don't up close and personal.... ya know what i mean! Glad to hear that Amber is excited for her summer reads... I hope you two are having a great weekend. My birthday is on Tuesday so i'm celebrating today. I get to go shopping! Congratulations to you both for successfully finishing your school year. Reading your wrap ups each week it really does sound as if you have had a very successful year with lots of learning achieved. I hope you both have a wonderful summer break! I love art museums. We don't have a very impressive one here. We have to travel to see a decent one. Little Red Riding Hood is doing her end of the year presentation on dance and has been studying Degas a bit. We love his work. You have accomplished so much with your daughter this year. I look forward to her appointment and hopefully getting more help to make her days smooth and successful.